3-O-Methyldopa (3-OMD) is one of the most important metabolite of L-DOPA, that is used in the treatment of the Parkinson's disease, particularly to increase the dopamine levels . Catechol-O-methyl transferase is the enzyme in charge of 3-OMD formation, which is produced from L-DOPA in many organs. Nevertheless, its half-life (15 hours approximately) is longer than the L-DOPA 's half-life, which is about one hour. This means that it is accumulated in the plasma and the brain of chronic L-DOPA therapy patients such as people suffering from Parkinson disease. We can find it in high concentrations basically in two places: plasma and cerebral spinal fluid of Parkinson's disease. Inhibition of striatal uptake of tyrosine. Competition with L-DOPA for the blood–brain barrier transporter system. The most common and important treatment for Parkinson's disease is L-DOPA, used in all patients at any time of the disease evolution. It produces a decrease in symptoms of the disease. In fact, almost all patients that are treated with this drug show a considerable improvement. However, there is a controversy of whether L-DOPA and 3-OMD may be toxic. Some studies have proposed that 3-OMD increases homocysteine levels, and this amino acid induces cardiovascular disease and neuronal damage. Some other toxic effects could be oxidative DNA damage which can cause cell death, a decrease in locomotor activities and diminishment in mitochondrial membrane potential. Action of entacapone (1) inhibiting the activity of COMT modifying the levels of L-DOPA and 3-OMD in periphery. As we know, it is necessary to produce the passage of L-DOPA administered to the blood brain barrier (BBB) to supplement the lack of dopamine suffered by patients with Parkinson's. 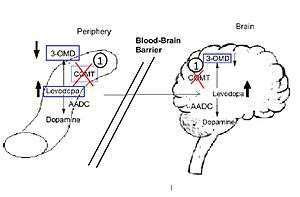 Due to the high peripheral degradation rate of L-DOPA, high doses are required to improve the levels of this enzyme in blood brain barrier. Those increments are often associated with dopaminergic side effects. For this reason, several studies reported some mechanisms that can prolonge the concentration of L-DOPA. Compounds capable of decreasing 3-O-methyldopa, like entacapone or tolcapone (COMT-inhibiting substances), when administered in combination with L-DOPA, lead to prolonged availability of this drug, thereby prolonging its effects. On the other hand, the possibility of blocking peripheral decarboxylation by adding an aromatic amino acid decarboxylase (AADC) inhibitor has been studied. These effects increase the methylation of L-DOPA and increase concentrations of 3-O-methyldopa. Clivel Charlton et al., demonstrate that 3-OMD accumulation from long-term L-DOPA treatment may be involved in the adverse effects of L-DOPA therapy, although more studies are needed to corroborate it. Dopamine and 3-OMD synthesis until final conversion to vanillactate from L-dopamine degradation. Abbreviations: DDC, dopa decarboxylase; DA, dopamine; COMT: catechol-O-methyl transferase; 3-OMD, 3-O-methyldopa; SAM, S-adenosylmethionine; SAH, S-adenosylhomocysteine. 3-O-methyldopa is a major metabolite of L-3,4-dihydroxyphenylalanin (L-DOPA) and is formed by catechol O-methyltransferase (COMT). One of the L-DOPA's metabolic pathways is the decarboxylation and the other is the O-methylation. L-DOPA has the main role in the metabolic pathway as a metabolite in the biosynthesis of dopamine. This reaction happen in the process of decarboxylation by aromatic amino acid decarboxylase (AADC) also called dopa-descarboxilasa. Furthermore, L-DOPA also can be methylated in the methylation process to 3-O-methyldopa. DDC acting as decarboxylase inhibitor makes COMT main metabolic pathway catalyzing this conversion of Levodopa. 1 2 Parkinson’s Disease and movement disorders. Joseph Jankovic y Eduardo Tolosa. Ed. Lippincott Williams & Wilkins. Fifth Edition. ↑ Parkinson y Discinesias. Abordaje diagnóstico y terapéutico. López del Val y Linazasoro Cristóbal. Ed. Médica Panamericana. ↑ Lee, E. S. Y.; Chen, H.; King, J.; Charlton, C. (2007). "The Role of 3-O-Methyldopa in the Side Effects of l-dopa". Neurochemical Research. 33 (3): 401–411. doi:10.1007/s11064-007-9442-6. PMID 17713853. ↑ Tai, C. H.; Wu, R. M. (2002). "Catechol-O-methyltransferase and Parkinson's disease". Acta medica Okayama. 56 (1): 1–6. PMID 11873938. ↑ Maeda, Toshihiko; Hideyo Shindo (1976). 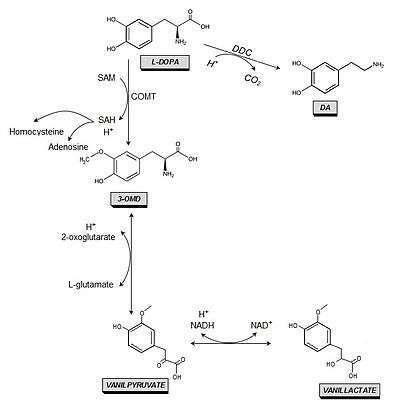 Metabolic pathway of L-3-methoxy,4-hydroxyphenylalanine (3-O-methylDOPA)-participation of tyrosine aminotransferase and lactate dehydrogenase. Chemical & pharmaceutical bulletin. VOL.24; NO.5; 1104-1106.